If your idea of bliss is to stay in quiet, tranquil surroundings, to sleep in a delightful room with a truly comfortable bed, to be served delicious meals and scrumptious cakes, and to be able to sew to your heart's content, then we think you will like it here! West Manse was built in the 1840's as the home for the Free Kirk minister. It has been lovingly restored to retain much of its Victorian character but with the advantage of modern heating and plumbing! 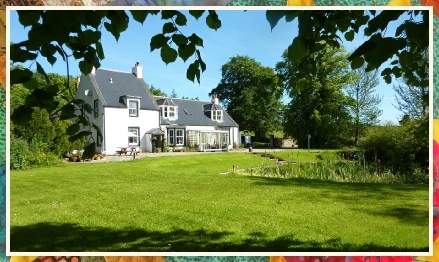 Standing in a very quiet rural location, just south of Cullen on the stunning Moray Firth, it is circled by a patchwork of rolling fields and enchanting woodland. Moray is renowned for its stunning coastline, historic castles, whisky distilleries and it’s numerous splendid golf courses. There are many short and long distance routes to walk, quaint villages to visit and dolphins to watch. The Cairngorm National Park, Aberdeen and Inverness are all around an hours drive away. Non-quilting spouses/partners are more than welcome to stay, this way you can both do your ‘own thing’ but still share an amazing holiday together. We’ve tried to cover most aspects in this site - but we are bound to have missed something! Any queries you have, no matter how small, just get in touch. “What a great week we have had with you! great food and being able to sew all day! I had a fabulous time with you and now home, am in awe of what we achieved in such a short time. My confidence has risen 200 percent in what I can do.